A new update rolling out to the Android Allo app also upgrades some popular emojis. While all Marshmallow and Nougat phones will soon be able to summon Google Assistant just like Pixel users are able to do, Google hasn’t forgotten about Assistant’s other home: Allo. A new update rolling out brings a new way to incorporate Google’s AI aide into your chats, as well as a few other features. Until now, calling on Google Assistant in Allo wasn’t the easiest thing in the world: You had to manually type “@google” in the window before sending your query (as well as remember that you could do that). With the latest update, Google has added a new Google Assistant icon between the emoji picker and microphone. Tap it and it’ll automatically insert “@google” and bring it into your conversation. Here’s a GIF of Allo’s new GIF searching feature. And since no conversation is complete without a GIF or two, you can now search for them right inside the app. All you need to do is tap the emoji button, scroll past your suggestions and pull until the blue “Pull for GIFs” bar fills the screen. Then you can search and send GIFs, or throw caution to the wind with the Lucky bot. When searching for a GIF, type @lucky followed by whatever you want to search for and it’ll pick what it thinks is the best one for the occasion. Finally, you can also add a little more life to your emojis. When you select one of the supported icons, you’ll be able to increase the size and animate it using a new slider built into the send button. Just tap and hold the paper airplane icon and you’ll be able to change the size of the icon or (at the biggest size) animate it. However, it only works with 10 common emoji, including smile, heart eyes, grimacing, kissing heart, tears of joy/laughter, and unamused. The update is currently rolling out to Android phones and will come to the iOS app soon, Google says. 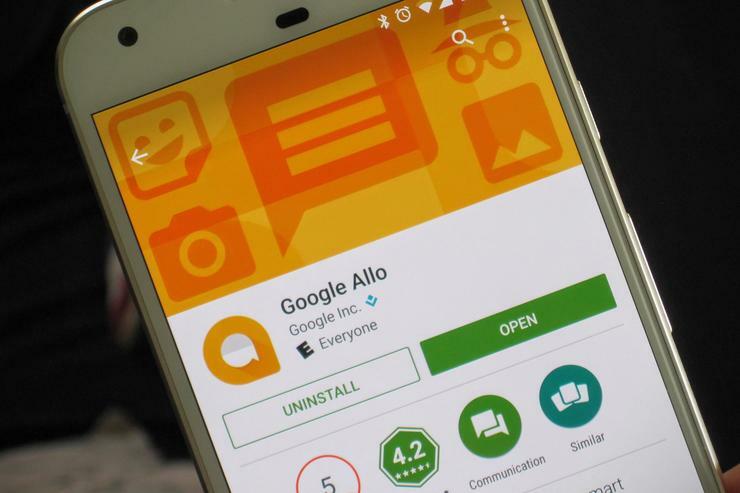 Something to talk about: Google’s latest messaging app hasn’t exactly set the Android community on fire, but there are definitely some good things about Allo, chief among them the Google Assistant integration. By adding a dedicated icon, it doesn’t just make it easier to use, it lets people know that it’s there, which will help expand its use. While we’d certainly rather Google introduce true SMS support than any of the features here, we’ll take what we can get. But mainly, it’s just good to see that Google hasn’t abandoned support for Allo.